So I am always looking for new styles for Kaycie that will last a week or longer and take a short amount of time to do. I hate doing hair daily because I love my sleep in the morning 🙂 I am not great with cornrows because I am horrible at parting and I am slow beyond belief. Despite these shortcomings, I decided to try the braided bun. It came out ok and it took me about 1.5 hours to complete. Hopefully it lasts the week. Part beginning at the top and proceed around clockwise. Determine the middle if the head ahead of time. 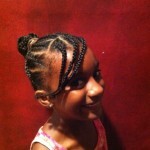 All braids should be done towards the middle. It may be helpful to part ear to ear to begin with. Stick with whatever spot you chose as the middle. Don’t try to braid hair in the middle of the bun if you happen to choose the wrong spot. It doesn’t look better than just braiding to the wrong spot.